We've got lots of clothes in stock and we'll show them as soon as we find the time to take pictures. 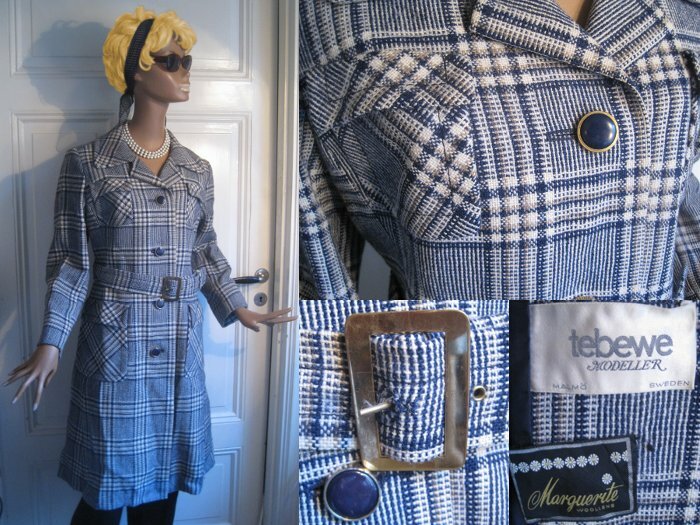 Vintage 60's glencheck coat, spring/fall. Swedish design from Tebewe Modeller. An eyelet missing in the belt. Dry clean. Size 36-38 (unlabeled). L=104, C=47, W=44, SL=55 cm. 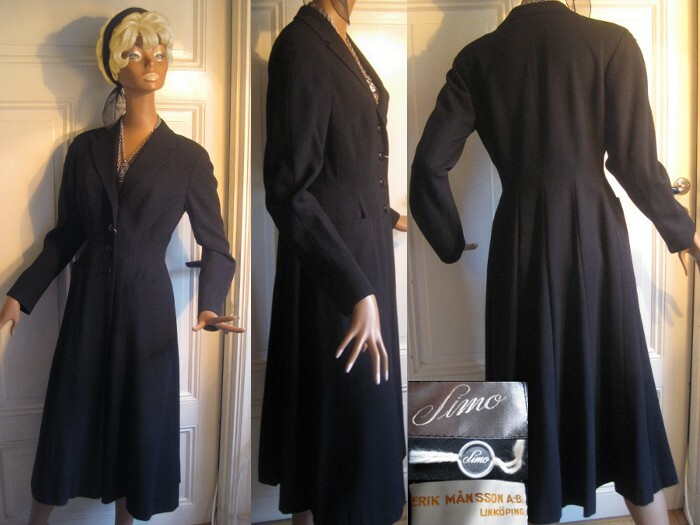 Vintage Swedish 50's black cheviot coat, spring/fall. Labeled Simo & Erik Månsson. Mint condition. Wool blend/Cheviot. Dry clean. 34-36 (unlabeled). L=114, C=44, W=35, SL=55 cm. 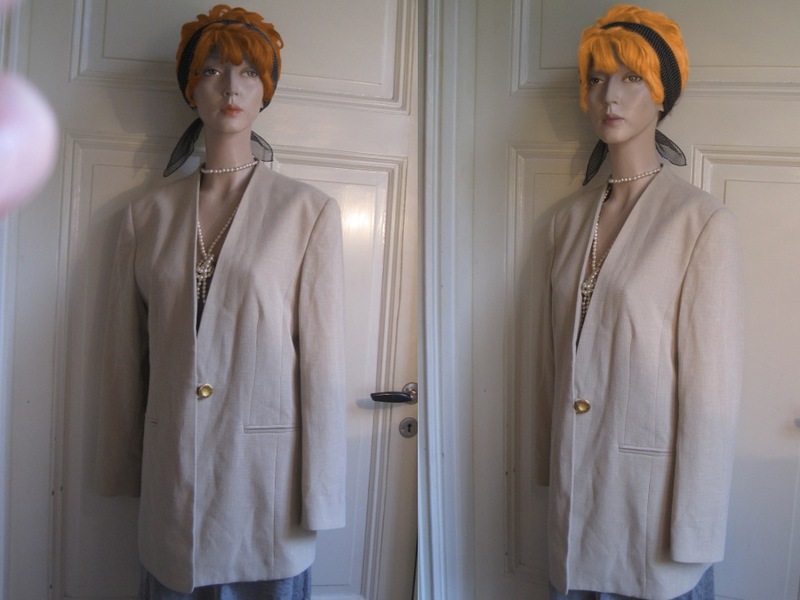 Vintage 70's coat, spring/summer. 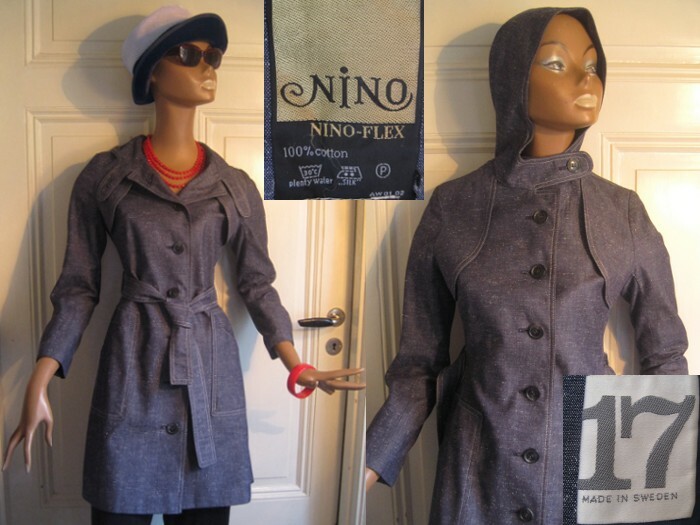 Made in Sweden for Nino-Flex. Mint condition. Cotton 100%. Washable in 30 degrees C.
Size 34-36 (unlabeled). L=80, C=42, W=38, SL=54 cm. 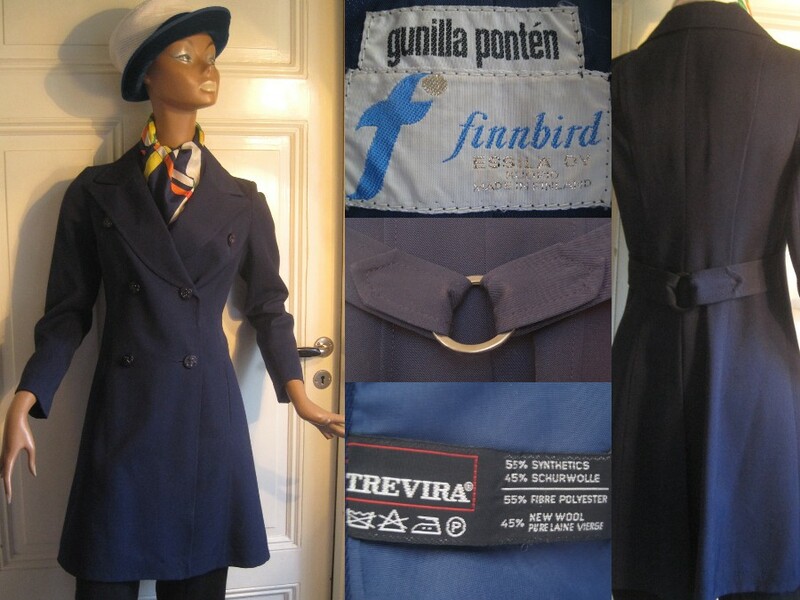 Vintage 60's navyblue coat by Swedish designer Gunilla Pontén for Finnbird, spring/fall. Sailor style buttons, strap in the back. Trevira: Polyester 55%, new wool 45 %. Dry clean. Size 34. L=88, C=38, W=36, SL=55 cm. 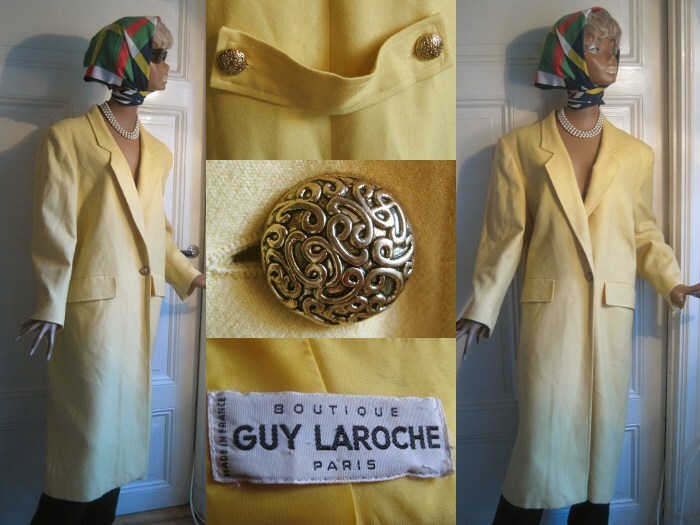 Vintage 80's yellow coat by Boutique Guy Laroche Paris, spring/fall. Size 38-40. Auction at Tradera, starting bid 199 SEK. 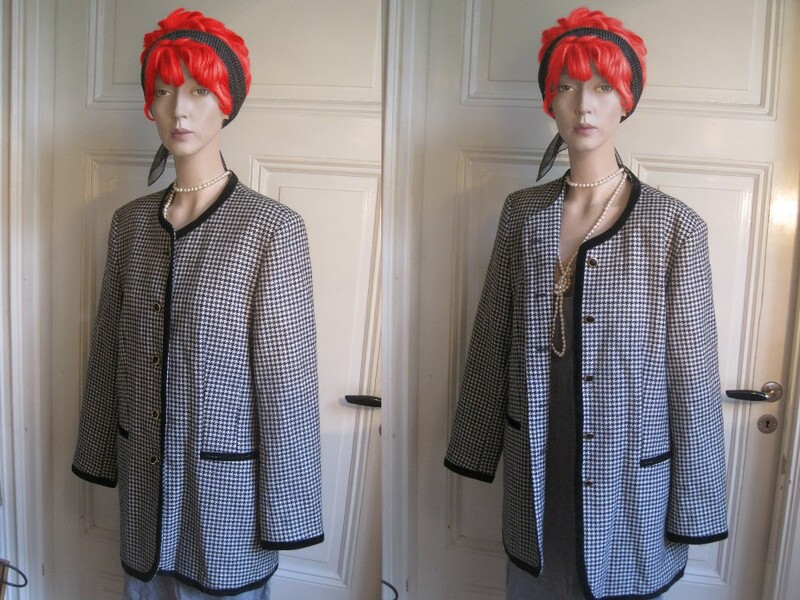 Wolfgang Kaiser Colette blazer. Size 38-40. Auction at Tradera, starting bid 50 SEK. Auction at Tradera, starting bid 50 kr. Sizes specified on older clothes usually differ, please note the measurements taken on garment laying flat (double for full size): C=Chest width taken under the sleeves, W=Waist, H=Hips, L=Length, SL=sleeve length, IL=Inseam length (on trousers). Further measurements on request! Most of the items are second hand goods. More pictures and information on the condition of a specific item can be e-mailed on request! Clothes can be shipped abroad using the Swedish postal service. For sending goods within Sweden we also use Schenker, DHL and Bussgods. You may also collect the items in Stockholm, Sweden. Payment in advance to our Swedish bank account (Plusgirot, Nordea) or, if collected in Stockholm, cash or card (VISA/Mastercard). Second hand goods are sold under the rules of margin scheme, which means there is no VAT to be withdrawn.